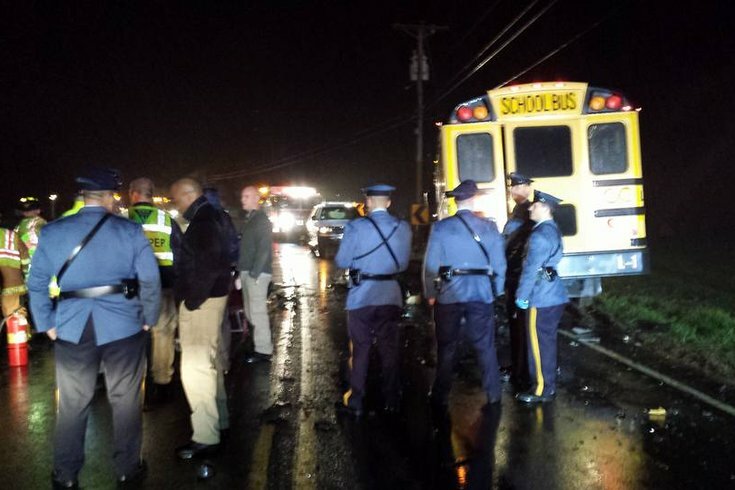 State troopers investigate after a car and a school bus collided in Burlington County Tuesday afternoon. Two people are dead and nine are injured after an accident involving a school bus in Burlington County Tuesday afternoon. According to New Jersey State Police, the crash occurred around 5 p.m. in Southampton on Pemberton Road. Authorities say that based off their preliminary investigation, a Volkswagen Passat hit a school bus that was carrying the Lenape Valley High School swim team - 20 total students - as well as two coaches and the bus driver. After the collision, the driver and one passenger inside the Passat, both males, were pronounced dead on the scene. Eight students and one of the adults on the bus were taken to Virtua Hospital in Mount Holly to be treated for minor injuries. State troopers are stressing that these findings are only based off of a preliminary investigation and that police are still looking into the incident. More information is not expected to be made immediately available.